Epic Landscape Construction, INC. is a local, family owned and operated business. It all began with Gary and Jan Paris and their ‘fairy-tale story’ as two high school sweethearts who fell in love, married after college and quickly started their ‘happily ever after’. With true love for the Valley of the Sun, they knew Phoenix, AZ was the city to raise their family and start a business. With a wheel barrel and an iron will, Gary and Jan built Epic from the ground up. 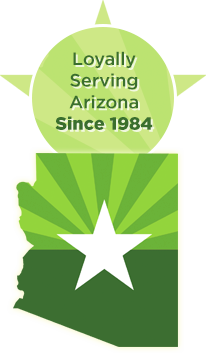 Epic in now a full service, award winning, commercial maintenance and construction landscape company, loyally serving Arizona since 1984. Gary went on to build and develop two multi-tenant industrial projects. Both building won Spec Industrial Building of the Year Award recognized by NAIOP, the Commercial Real Estate Development Association in 2002 & 2007. Gary & Jan’s two daughters, Stacy and Misti, have created a second generation by joining the family business. We are a proud family of ASU Sun Devil graduates. Stacy has an ASU bachelor’s degree in Business Marketing and is the Director of Operations. She originally developed Epic Sweeping Service and currently oversees all aspects of the company. Misti has her bachelor’s degree in Journalism and Mass Communication as well as her real estate license and operates the development division of Epic. She also speaks fluent Spanish which is a major contribution to Epic. Rob, Gary’s son in law, has his ASU bachelor’s degree in BIS and enjoys his role with customer relations while overseeing maintenance and landscape projects. Rob has also obtained his Structural Pest Control Board License. The majority of our employees, including maintenance labor crew have been with us for a decade or more. Our crew members are fully qualified and trained in all aspects of maintenance and safety requirements set forth by OSHA. We take pride in preserving our outstanding reputation by assuming full responsibility for the appearance of out maintenance assignments. To ensure that our mission of satisfaction is efficient, we work in a partnership approach to each and every project we encounter. The long lasting business relationships we have created and maintained over the years have made us successful company we are today. We are flexible for meeting your special requests and needs.